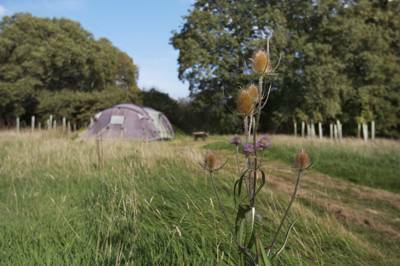 Sometimes when you discover a hidden gem of a campsite it's tempting to keep the secret to yourself so no one can spoil what makes it special – that all important peace and quiet. But with Chantry Farm, we're happy to sing it's praises 'til the cows come home because, even at full capacity, it still feels like you've got this place pretty much to yourself. Set over 54 acres at the foot of Westonbury Hill on the glorious South Downs, you only need to share this place with skylarks, sheep and a sprinkling of other guests. 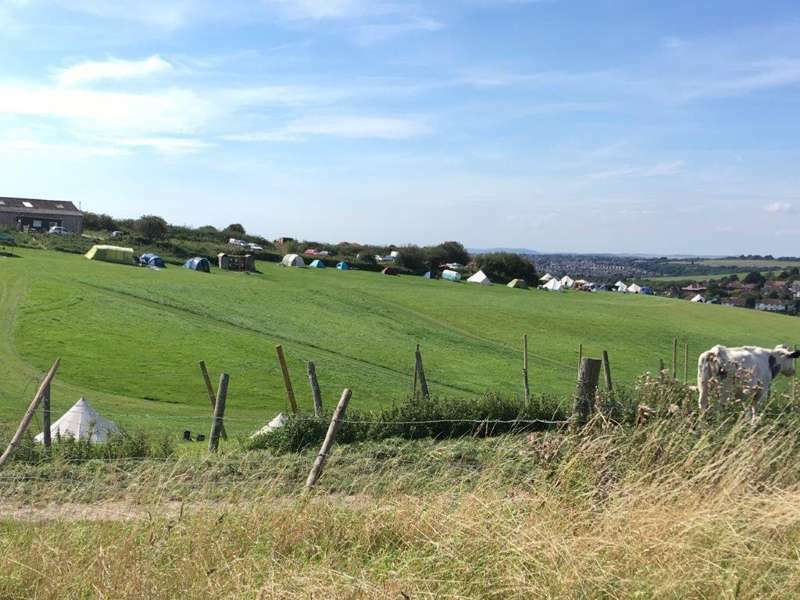 There are six spacious pitches scattered around this sheep farm's lush meadow, each with a fire pit and stunning views over the West Sussex countryside. The owners have kept it wild enough for wild flowers to flourish, but neat enough to not trip over on the way to the wash barn. 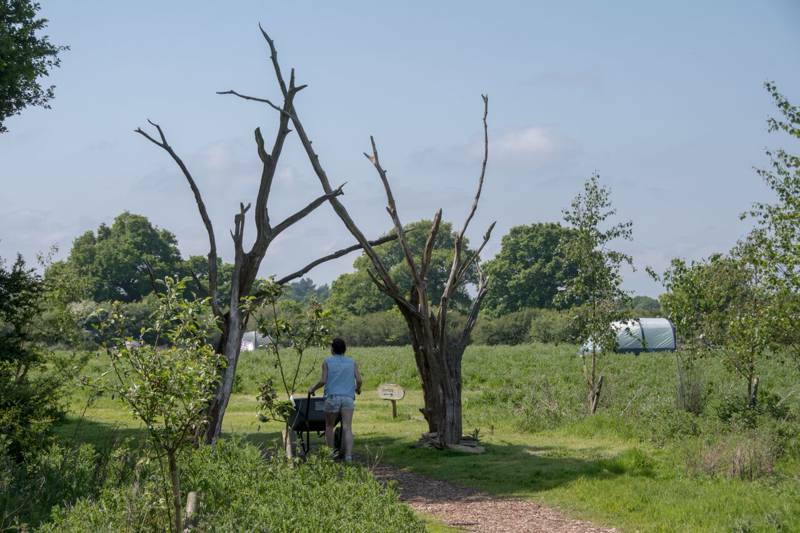 This is back-to-nature camping, with a compost loo and rustic washing facilities (all squeaky clean), allowing you to feel part of the landscape, not a drain on it. For more frills there's a choice of glamping options. 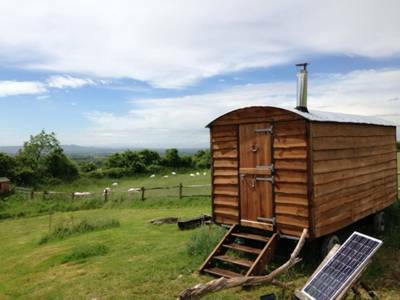 A shepherd's hut positioned in the farm's prime location offers breathtaking sunset views from its generously-sized double bed. It comes complete with soft cotton bedding, cooking facilities for simple fare, candles and even some shepherding history books so you can totally immerse yourself in the experience. For more space there's a new Welsh Douglas Fir hut which contains a comfy double bed plus two roll-down futons. The shutters at the end wall open onto a private field, again with spectacular sunset views – keep an eye out and you may even catch a glimpse of the barn owls that nest in a nearby ash tree. This is nearly as hi-spec as 'camping' gets, with a solar-powered mini-fridge, mini-sink, wood burner... even a USB phone charger. If you'd rather sleep under canvas book into the Lotus Belle tent (similar to a yurt) which has two windows, oriental rugs and roll-down futons and is kitted out so all you need to remember to pack is some food. 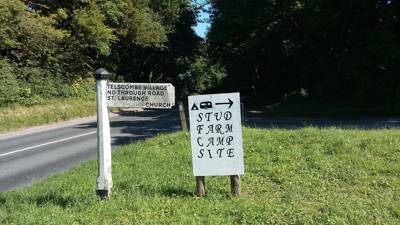 There are walks and cycle routes aplenty to keep you occupied and the campsite is perfectly placed to explore the South Downs National Park. It's hard to believe that buzzing Brighton is just 10 minutes away. This intriguing land is also steeped in Bronze Age lore, with the ancient barrows and nearby hillforts offering both a glimpse into the past and commanding views over today's landscape. For further historical nuggets, head to Pyecombe's churchyard and note the 'Pyecombe Hook' integrated into the gate – a vestige of the region's rich shepherding heritage... then reflect on the symmetry from the comfort of your cosy shepherds hut on the hill. Spent a lovely weekend here. 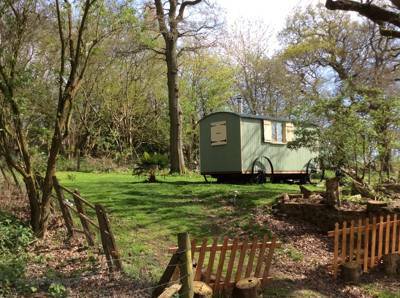 Peaceful site with lots of space and well organised eco facilities. Campsite owner very helpful and thoughtful. Highly recommended. We spent a weekend here at Chantry Farm in early July. Its a really beautiful location with amazing views and our pitch size was huge. We felt nicely spaced out from the other campers. Beki the host was really friendly. The facilities are very basic (no showers just a wash room) but very eco friendly and added charm to our experience. The only downside was the noise of the A23 nearby but that's outside of the camp's control. 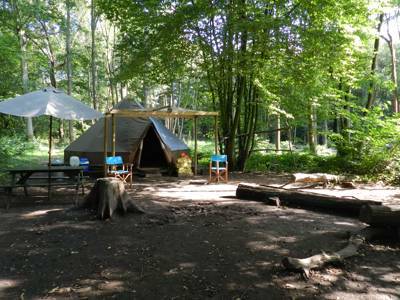 However we would gladly recommend this site to anyone who likes rustic camping. 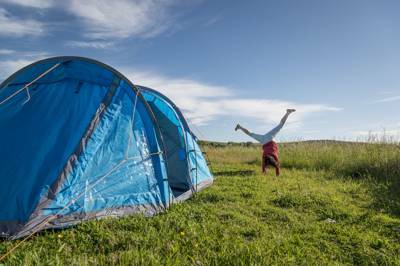 6 spacious camping pitches with fire pits in a meadow plus a shepherds hut, wooden hut and a yurt for hire. 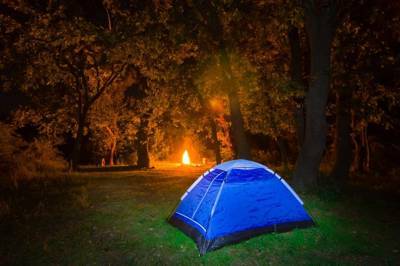 Tents and well behaved dogs – yes. Caravans, motorhomes and campervans – no. Shower, compost WC and washing up facilities. Crockery and cutlery can be borrowed and other equipment for hire including futon rolls and gas rings. Each camping pitch has its own fire pit. The South Downs, Britain's newest National Park can be explored by foot or on two wheels, with plenty of routes including the South Downs Way. Arundel Castle (01903 882173) is part medieval castle, part stately home and gives visitors a fascinating walk back through time. The pretty market town of Lewes is a short drive away with a lively farmers' market, good cafes, pubs and restaurants and a castle. And just 10 minutes away is the buzzing beach front of Brighton. No onsite shop, but there's an M&S less than a mile away. The local pub, The Plough (01273 842796), is well worth a post-ramble pint and a bite. The Royal Oak (01273 857389) at Poynings, The New Inn (01273 834608) at Hurstpierpoint, Ginger Fox (01273 857888) and The Bull (01273 843147) at Ditchling, all serve tasty grub and local beer. For a treat try the excellent Fig Tree Restaurant (01273 832183). 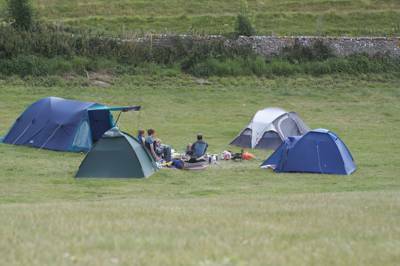 Camping £12 per adult per night. Huts from £158 for 2 nights. Yurts from £185 for 2 nights. Fire pits and wood crates £5. Take the A273 to Hassocks, then first left. Continue past The Plough pub on right and continue north for 1 mile on the old A23 to Pyecombe Street. The campsite is up a track straight ahead. The no. 17 bus runs between the campsite and Brighton. Bike hire is available at Hassocks train station, a 20 minute ride away.